This listing is an art print of the rivers and waterbodies of The United States, available in a range of sizes from 12x18in to 24x36in! This piece comes printed on thick, museum-quality, durable, matte paper. Welcome to Artful Data! I love exploring the beauty of the information around us every day, and I pride myself on capturing that beauty in the form of unique wall art for your home. 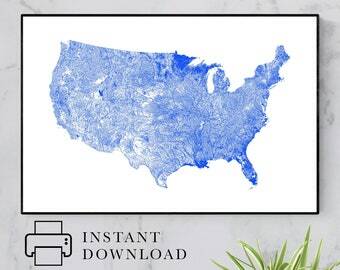 My United States map is created from public watershed datasets and shows the thousands of rivers and waterbodies of the country in incredible detail. These images are extremely high resolution, so they look great up close and far away. 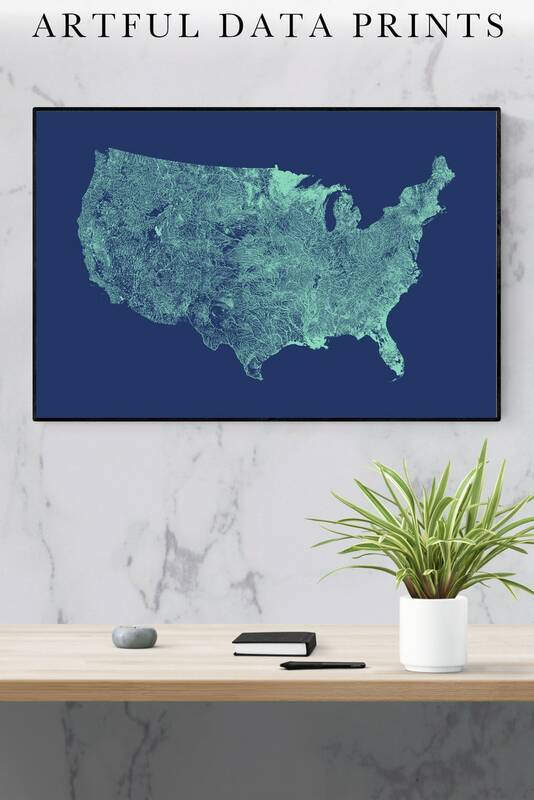 They make great gifts for lovers of maps, anybody with a special place in their heart for The United States, and anyone who enjoys unique wall art! This physical art print comes printed on thick, museum-quality, durable, matte paper, and is available in a range of sizes from 8x10in up to 24x36in! All of my art prints use archival, acid-free paper, the same kind of paper used by museums to preserve art that will last for centuries! This listing is for the art print only, the frame is not included. Color may vary slightly due to differences in computer monitors.